I love to teach curious little minds. Children's big, inquisitive eyes inspire me. For this theme, why not introduce your group to a few scientists? My daughters were very impressed to learn about Einstein. We searched the Internet for pictures and then came up with this silly Einstein mask. A fun way for them to remember this very famous scientist! 1. Gather your materials. 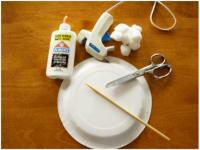 You will need a paper plate, scissors, a chopstick, cotton balls, white glue, or hot glue. 2. 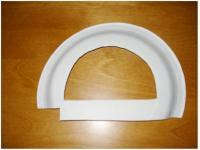 Cut the paper plate in half and then cut a half circle out of the center. Make a slit on one side to create a flat surface which will make it easier to glue the chopstick in place. 3. 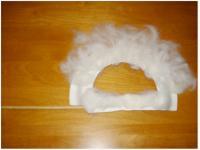 Stretch two cotton balls lengthwise for the moustache. 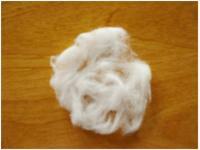 Stretch out several other cotton balls in a circular fashion as shown. 4. Glue the moustache on the straight side of the half circle. Glue the other cotton balls around the top to represent the hair. 5. 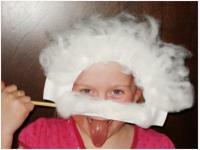 Encourage children to use their fingers to "comb" the hair to make it look like Einstein's hair. Glue the chopstick to the back of the paper plate. We used hot glue. Since it dries instantly, children can play with their mask right away. 6. If you used the Internet to show children pictures of Einstein, chances are they will have noticed the picture in which he stuck his tongue out... Children will love reproducing his pose over and over again!